Situated on beautiful Rankin Lake just minutes from Hwy 400 and Parry Sound, this spacious 3,000-plus sq. 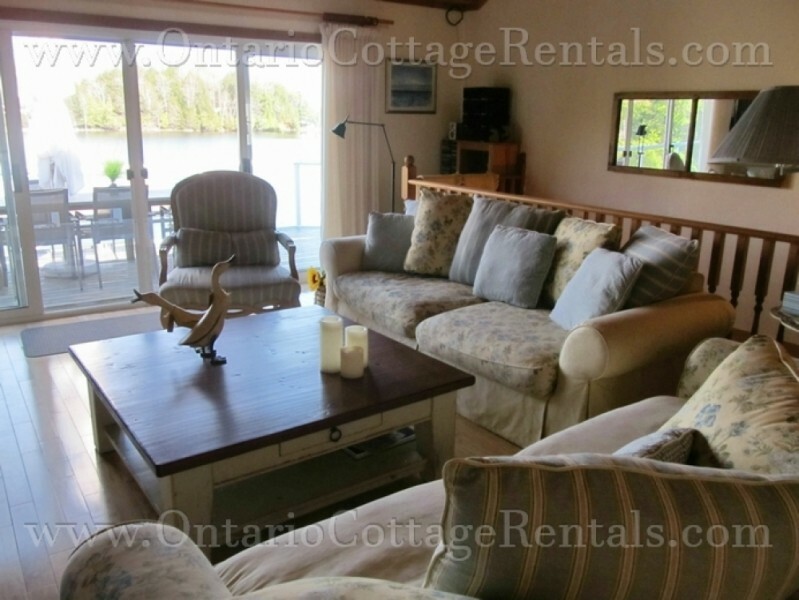 ft. year-round cottage offers the ultimate in luxury vacationing. 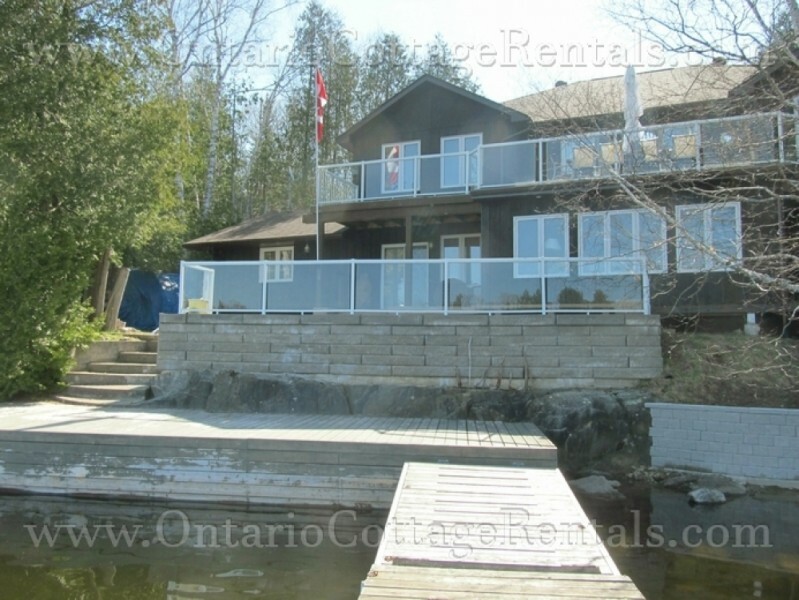 Boasting panoramic lake views and day-long sun exposure on its extensive waterfront, decks and docks, this finely furnished and beautifully decorated executive-style property is perfect for entertaining and relaxing. 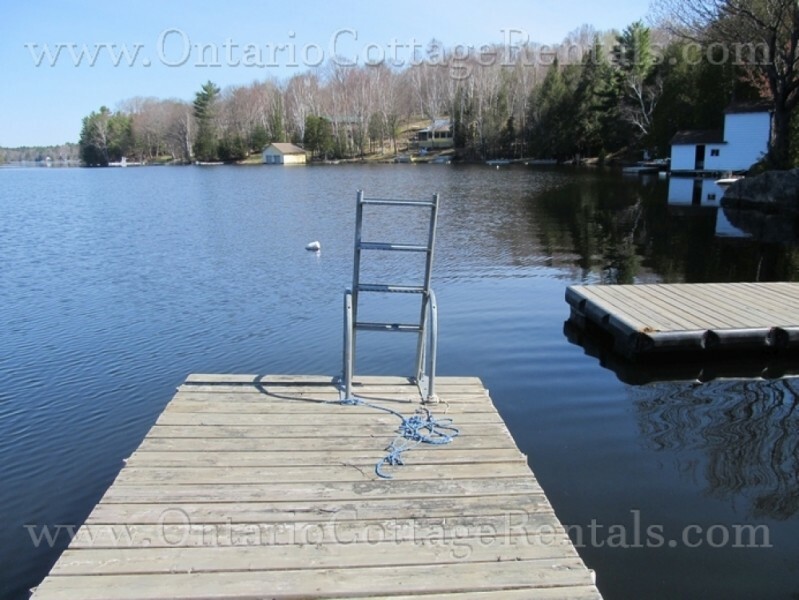 Perched overlooking a quiet bay, this level property offers easy access to the water for boaters and swimmers alike, with both shallow and deep sections accessible from its docks. 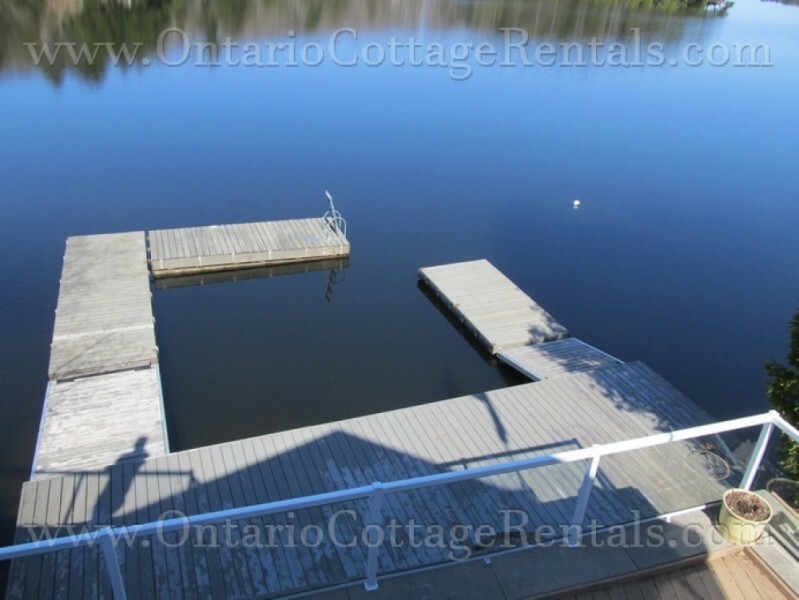 There are also plenty of great spots for some quiet fishing, as well as a unique and secluded sandy lakeside area that’s perfect for sunbathing and provides a safe place for younger kids to play. A number of watercraft are available, including canoes, kayaks and paddle boats (life jackets provided). 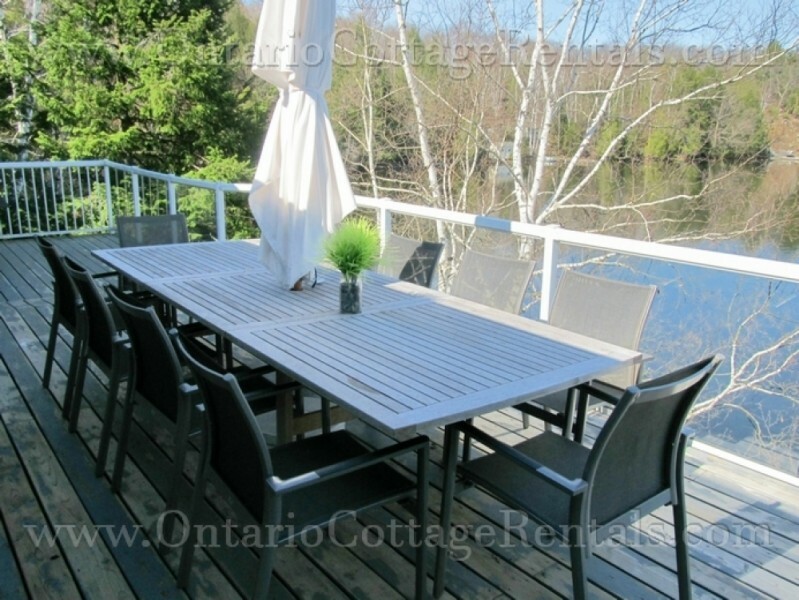 Other outdoor features include upper and lower level decks / patios with plenty of seating, as well as a propane BBQ. 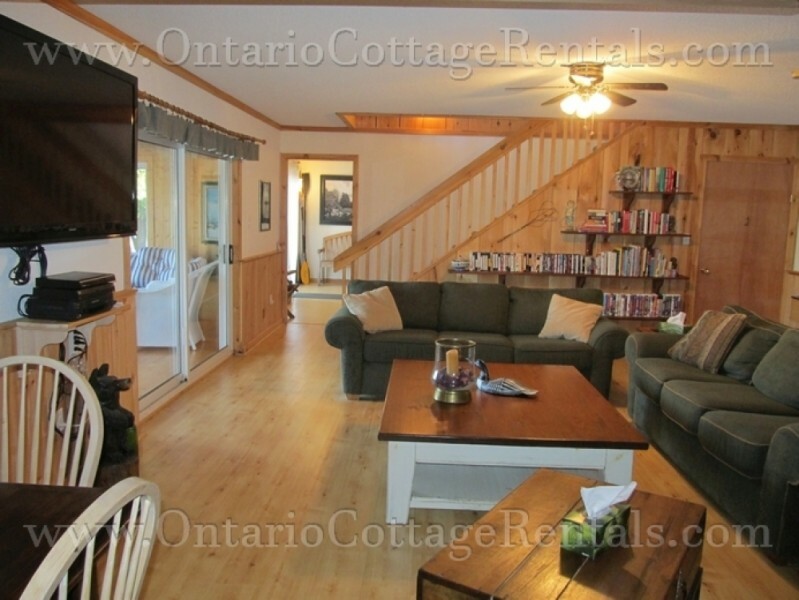 The cottage’s brightly decorated, fully furnished interior is equally spectacular, and boasts a huge modern custom kitchen with 2 huge fridge / freezers, stove, microwave and coffee maker, along with everything needed to prepare scrumptious cottage meals. There’s plenty of seating, too, including around the lovely marble topped island (matching the marble counter tops throughout!) 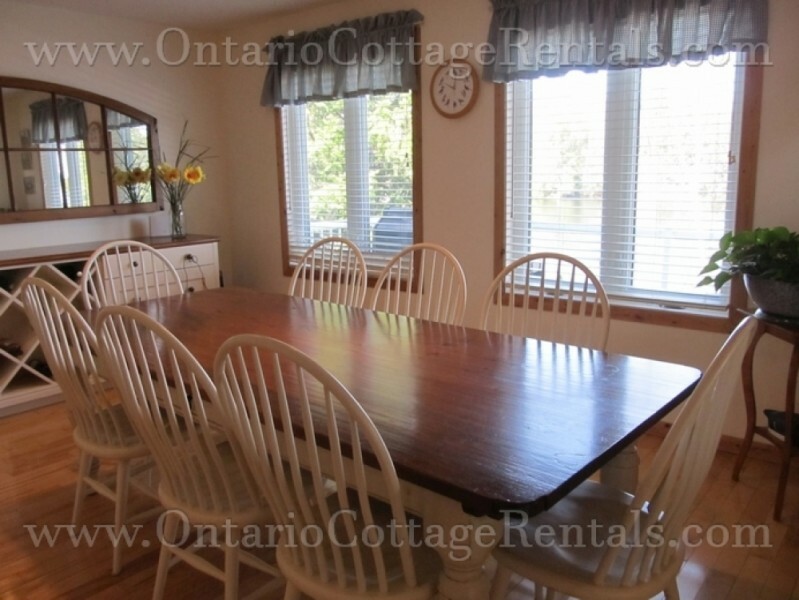 and the large dining table (with lake views!) suitable for up to 8 guests. 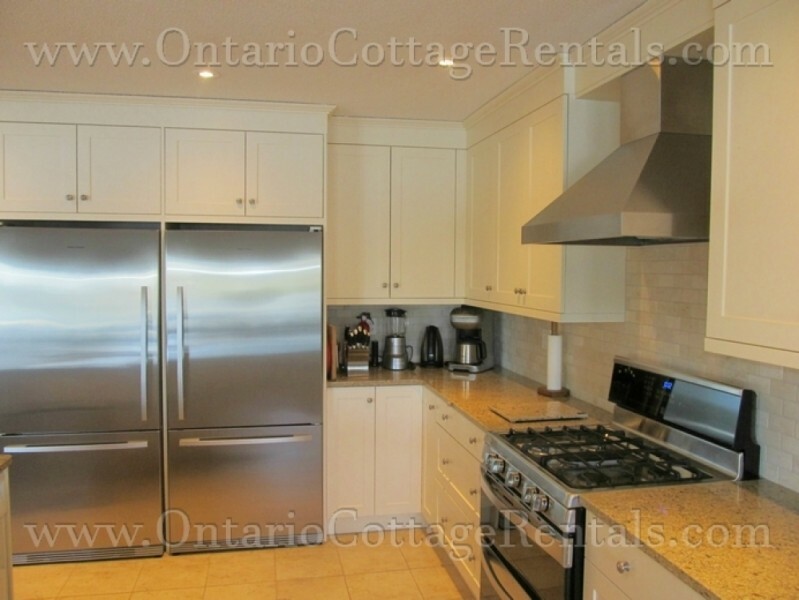 Adjacent the dining area / kitchen is a large open concept living room with high vaulted ceilings and in floor heating (throughout the main level! ), and extremely comfy designer armchairs and sofas. 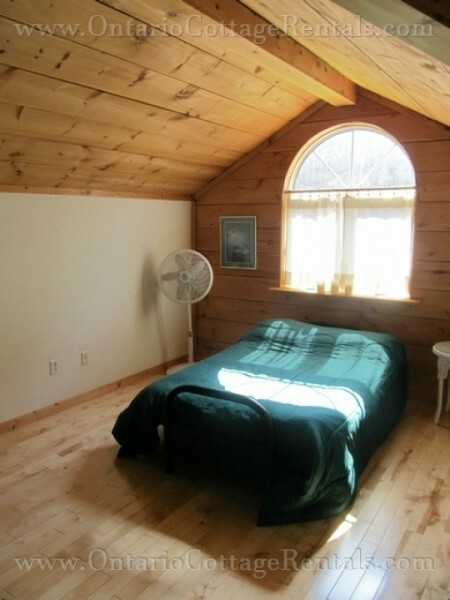 Come bedtime, there’s plenty of space for up to 14 guests to lay down their heads in this 5 bedroom cottage (2 king, 3 queen, 1 dbl, 2 singles, plus a lovely loft with a large pull-out), as well as 2½ bathrooms. 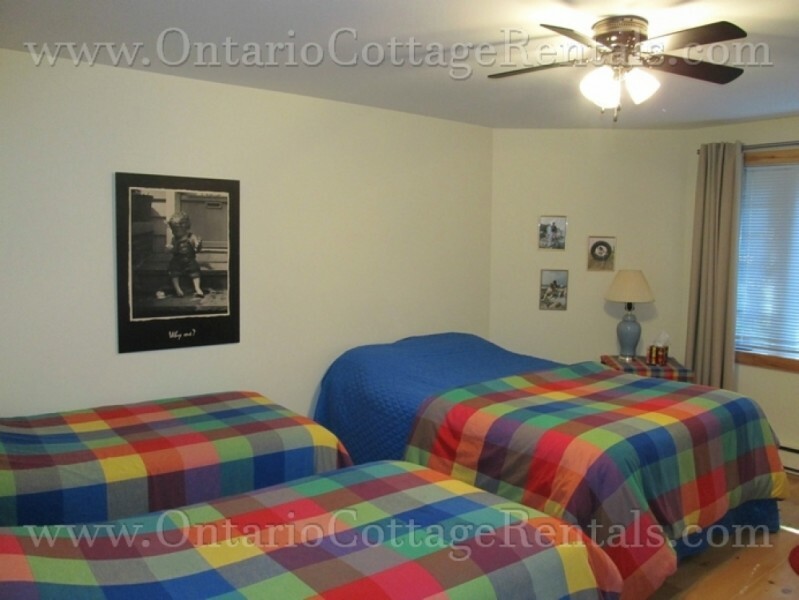 Three of the bedrooms are located on the main level – including the spacious master bedroom with its en-suite and lake views – with two on the sprawling lower level, where you’ll find one of the cottage’s other gathering spaces: a massive family / games room. 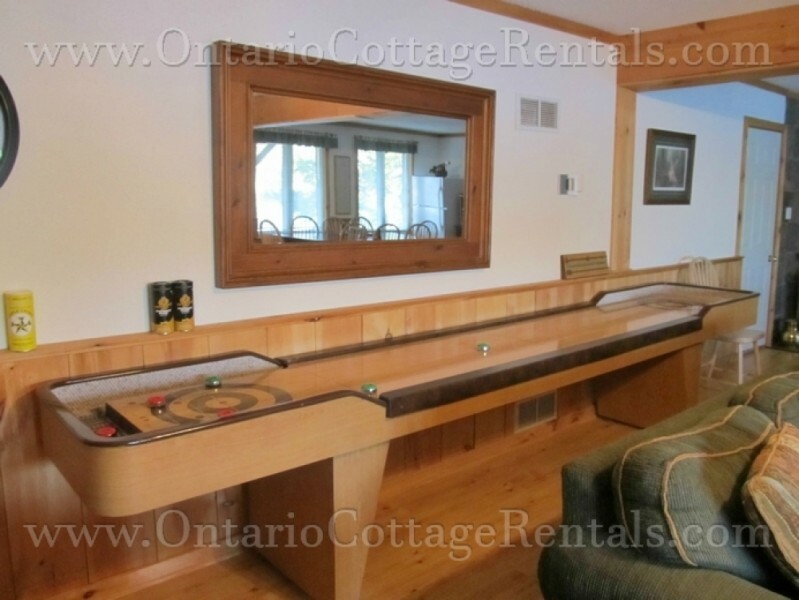 Highlights of this fun space are a Foosball table, shuffleboard and ping pong, numerous classic board games, and plenty of seating facing the media center with its large screen satellite TV. 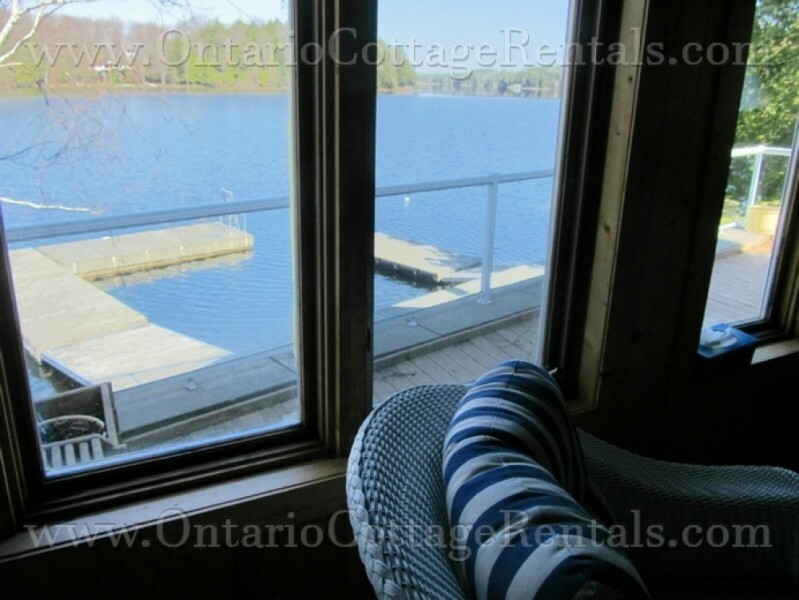 Other lower level features of note include a wood stove, 2 washers / dryers, a Muskoka Room with walkout access to the grounds and lake, and hardwood floors throughout. If visiting during the low-season, you’ll still find plenty of fun things to do outdoors. 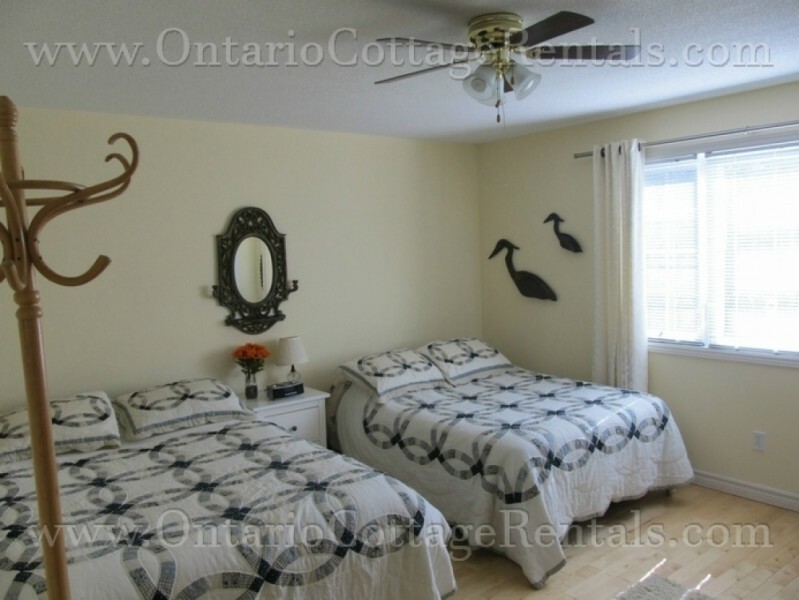 Highlights include viewing the spectacular fall colours reflecting off the lake, and come winter, cross country skiing, snowshoeing and easy access to area snowmobile trails. There is also a gas station with a convenience store, Licks Burgers, Dairy Queen just a few minutes away. 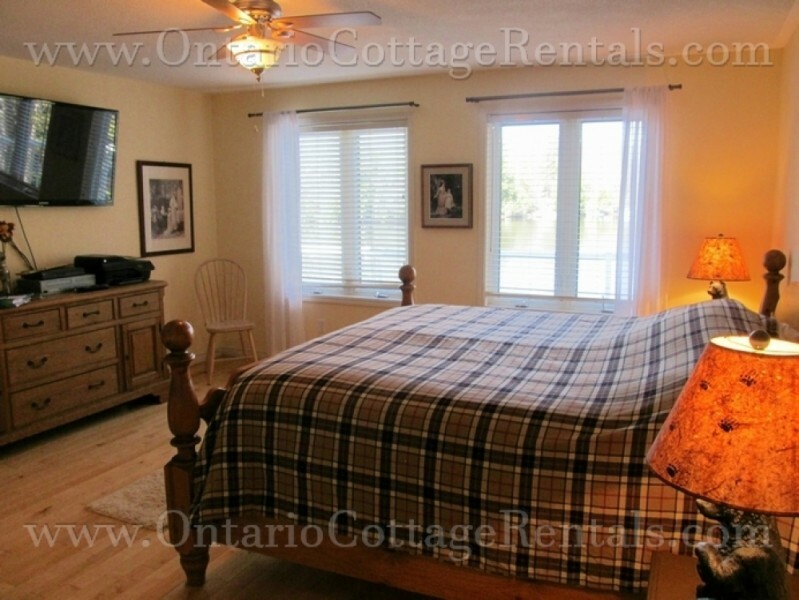 $2,625 per Holiday Weekend in Off Season - 3 night stay. 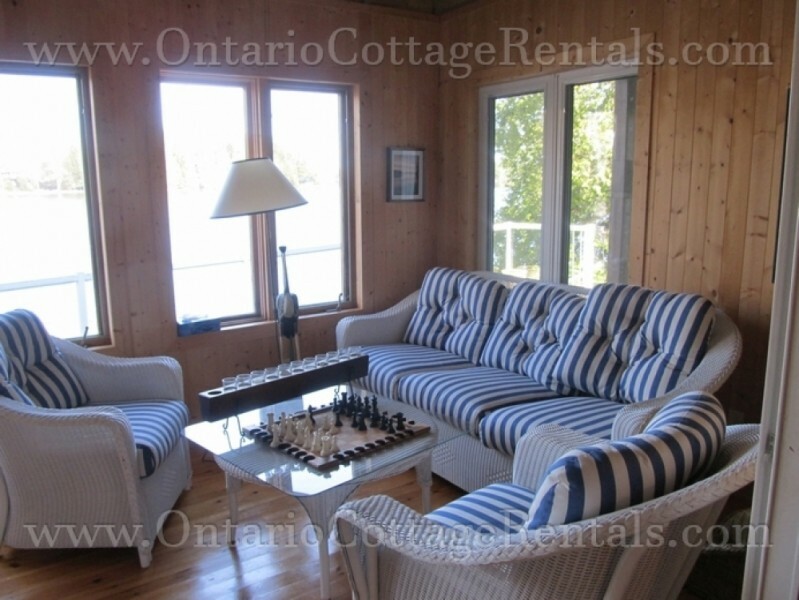 $1,750 per Regular Weekend in Off Season - 3 night stay. $2,000 refundable security deposit required. ﻿High-Season includes the last full week of June to Labour Day Monday, as well as the week of Christmas and New Year's and March Break.